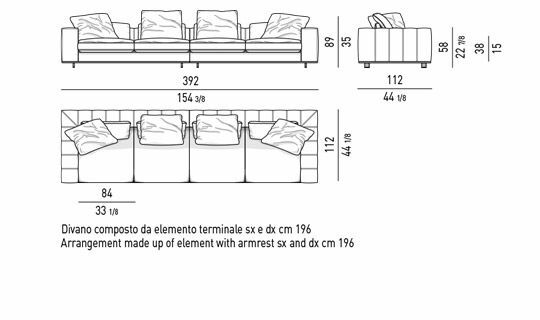 Innovating interior living space design through a seating system displaying into a variety of elements, with different features, a strong aesthetic identity, elegant proportions and unrivaled comfort. 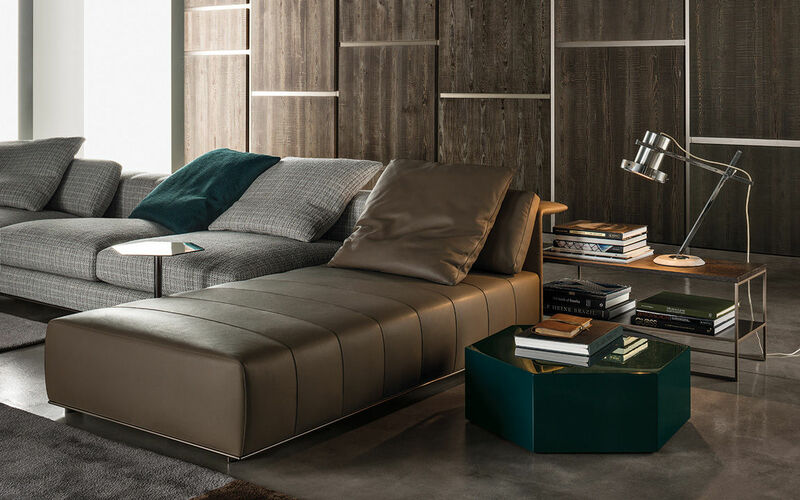 Freeman embodies this dual identity: the Freeman “Duvet” elements feature smooth, enveloping lines and extra-soft cushions that, like a warm embrace, induce a feeling of pure relaxation. 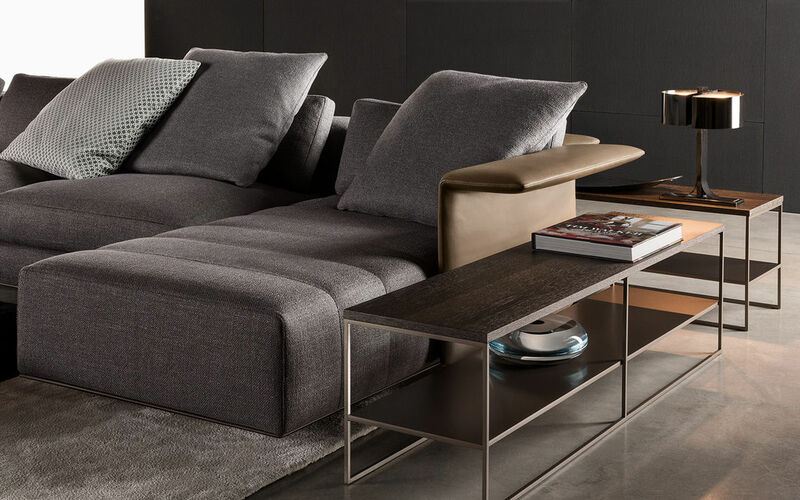 Freeman “Duvet” combines soothing design elements and especially sophisticated construction details steeped in tradition that evoke classical modern perfection. 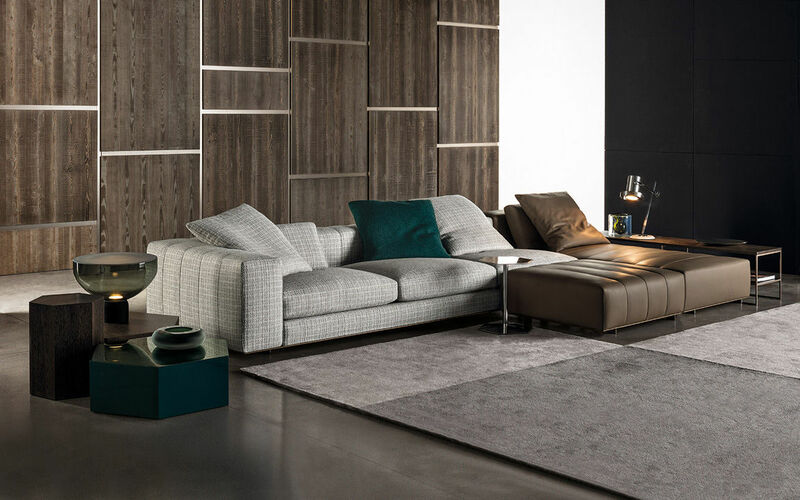 The Freeman “Tailor” elements express a different personality, with their more defined shapes and one-piece seats enhanced with top-stitching that accents their graphic nature and contemporary spirit. 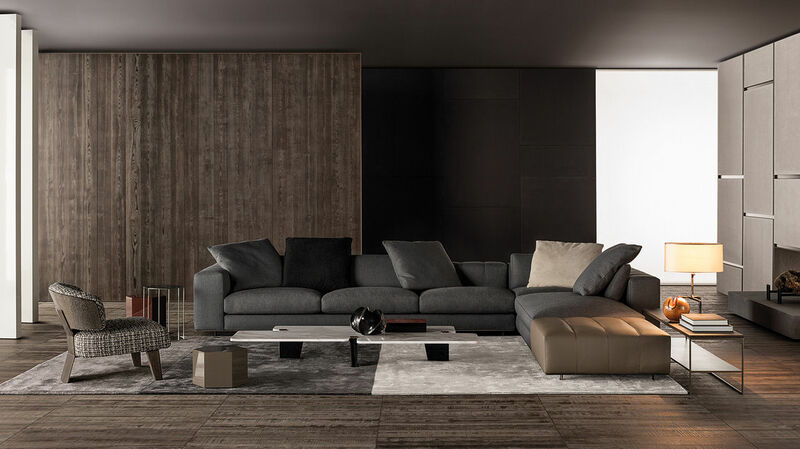 The wedding of these two spirits makes it possible to create “multitasking” compositions, with a dynamic air that characterize different moments in the day and different ways of using the sofa. 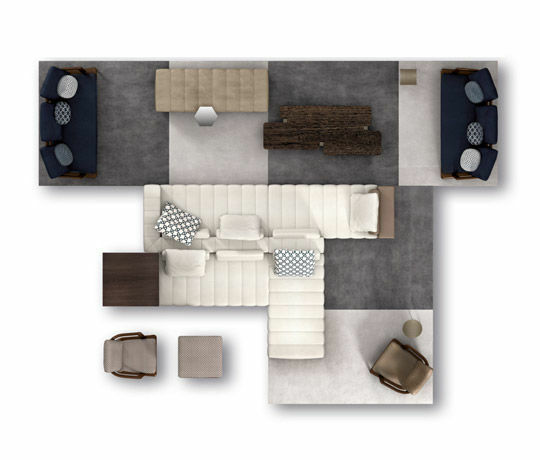 The Freeman seating system deservedly takes center stage in any living space, in which to enjoy the intimacy of family or entertain friends in an elegant, yet informal setting. 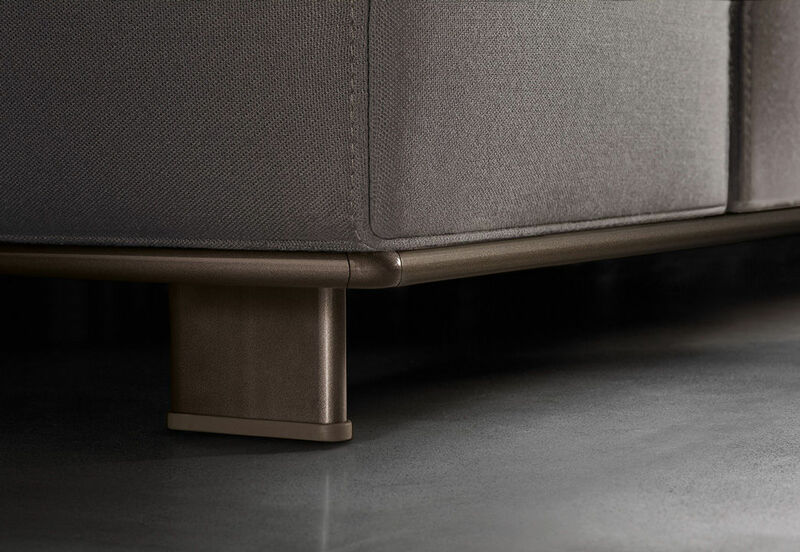 The base of the sofa is finished with an elegant, extruded aluminum frame with rounded edges in a glossy light bronze painted finish. 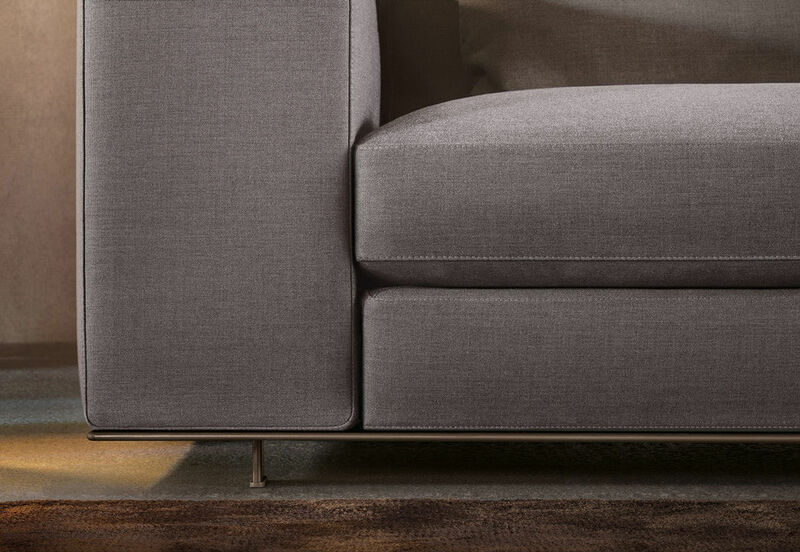 The cast aluminum joint fittings located at the corners are a defining detail that lends an air of sophistication to the sofa base. 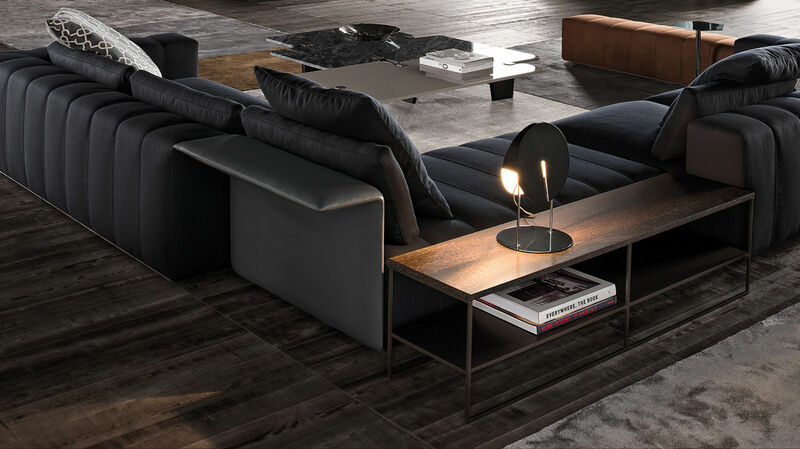 The sofa is raised off the floor on refined metal feet with a glossy light bronze painted finish for an effect of overall lightness. 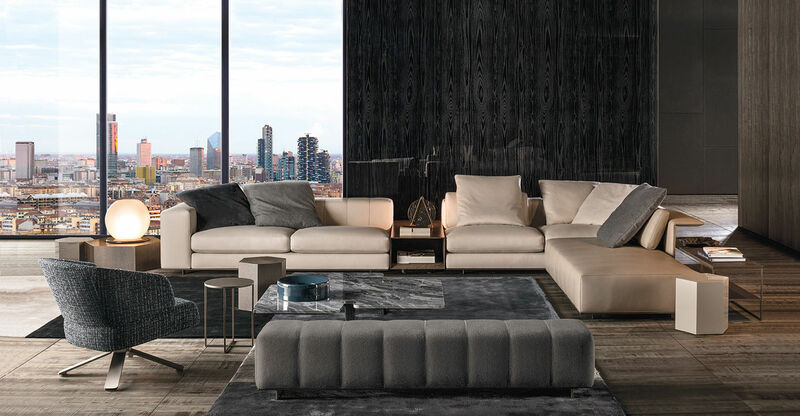 The Freeman “Duvet” and Freeman “Tailor” elements interact smartly with the coffee tables from the Calder series, now available with structure in bronzed metal and tops in Sand color glossy lacquer finish, Sucupira veneer with stained Mink finish or in Bardiglio Nuvolato and Calacatta marble. 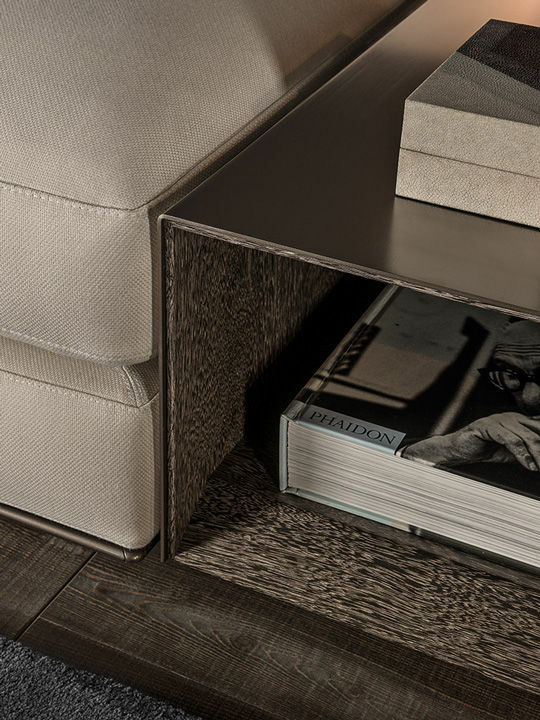 The coffee tables come in different sizes and, in addition to providing a handy table-top they also contribute to the creation of visually lighter compositions with a more dynamic personality. 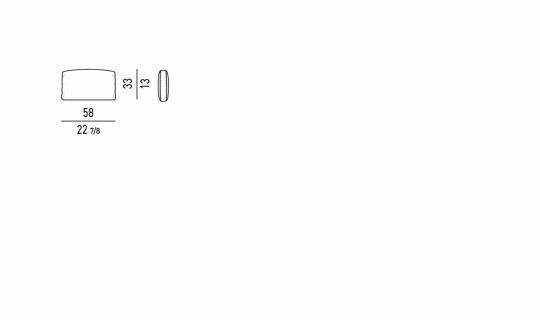 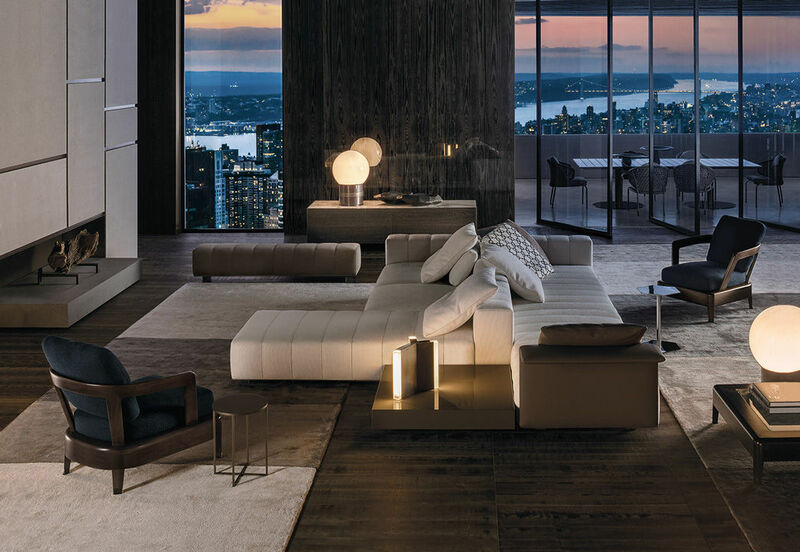 For full details, request a call back here. 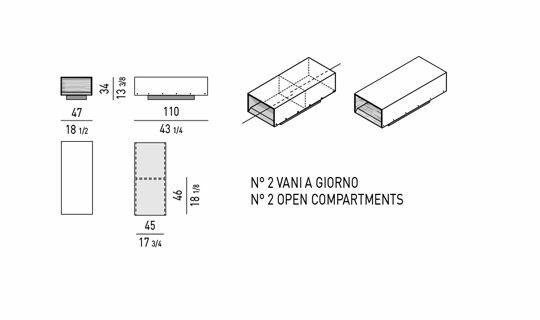 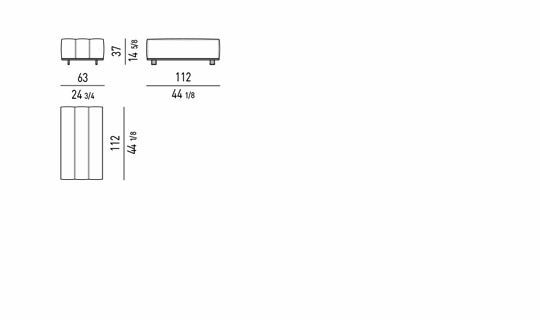 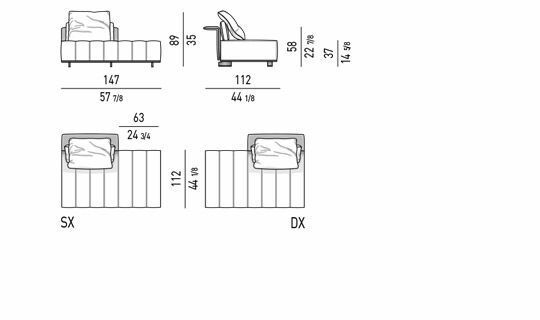 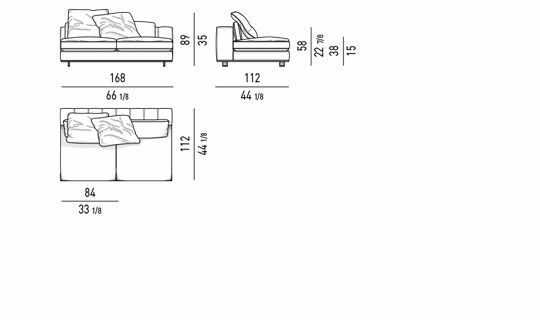 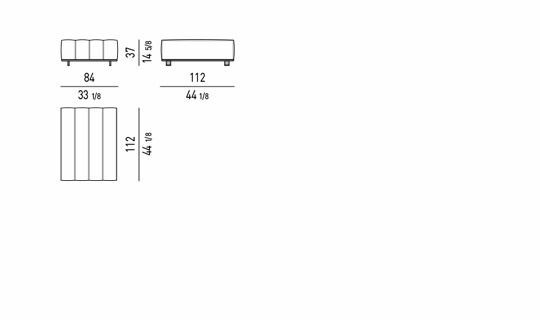 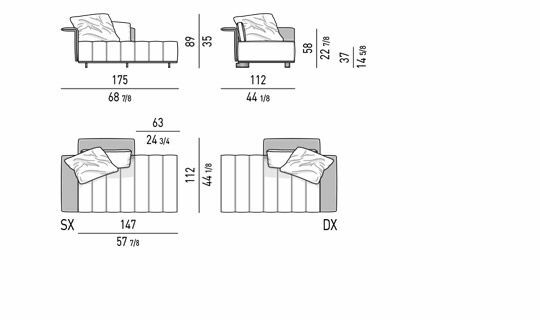 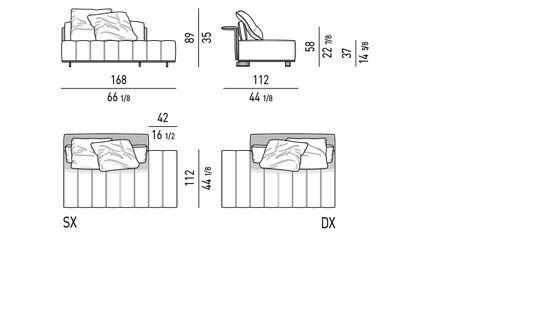 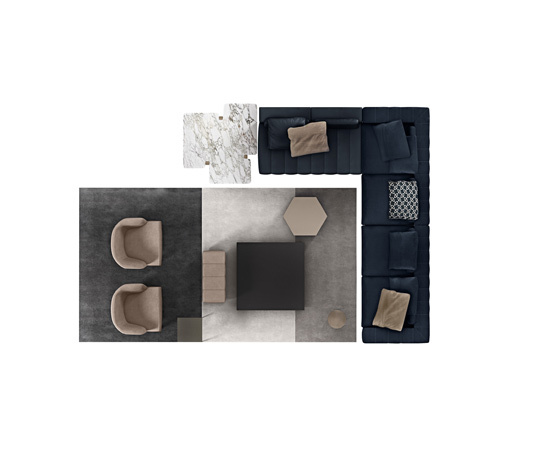 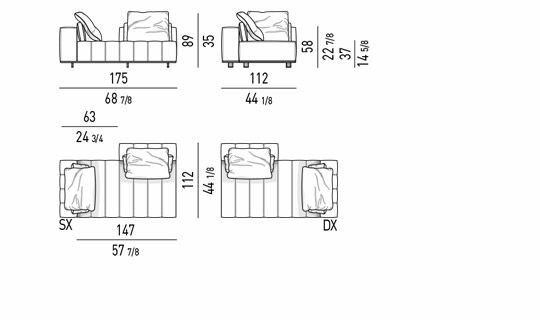 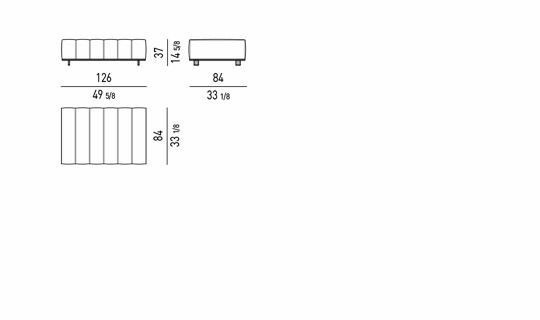 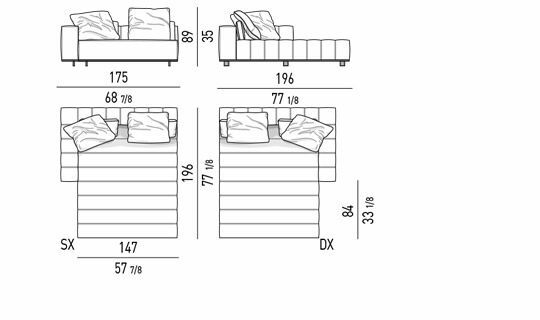 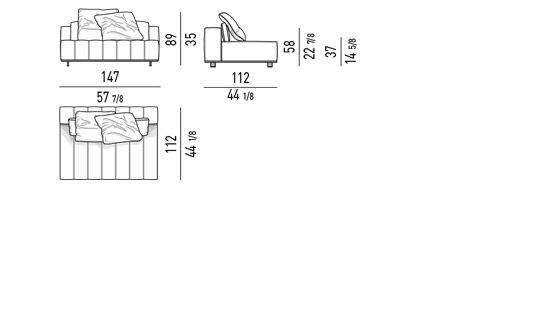 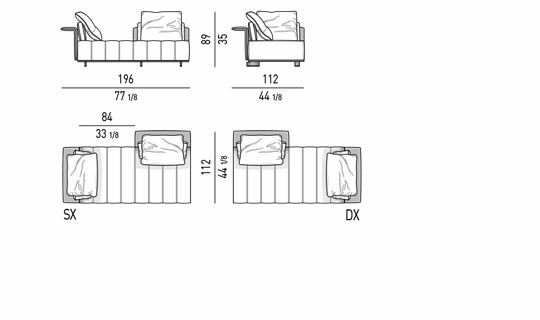 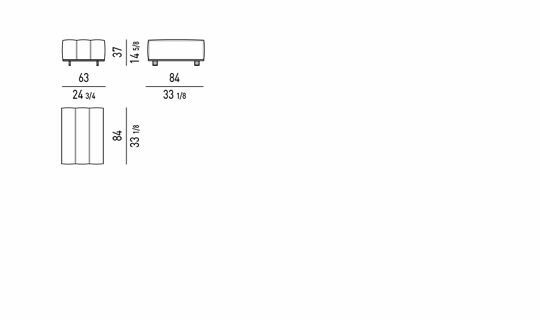 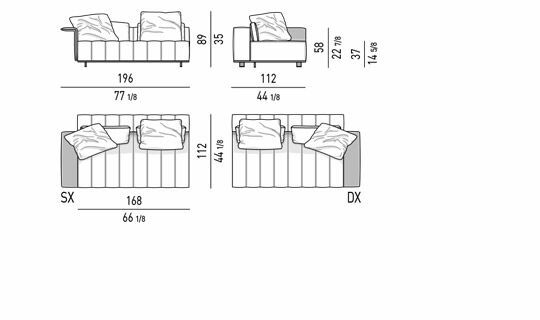 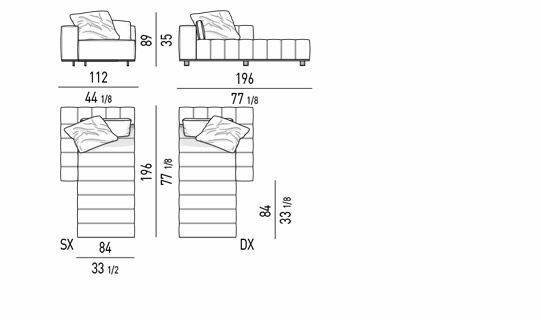 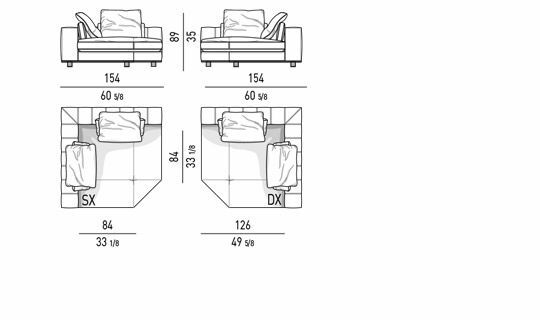 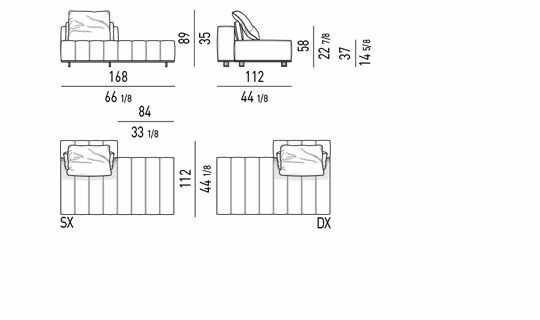 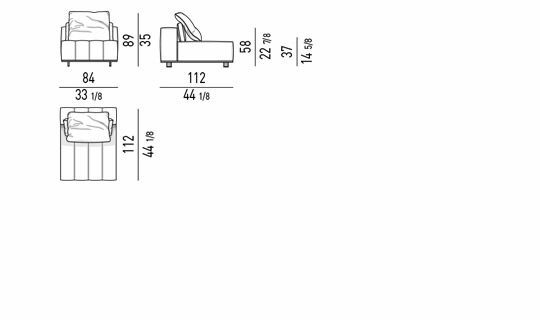 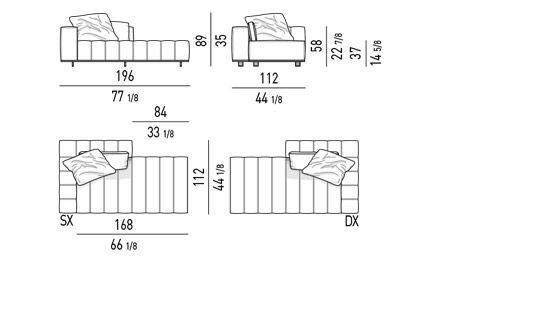 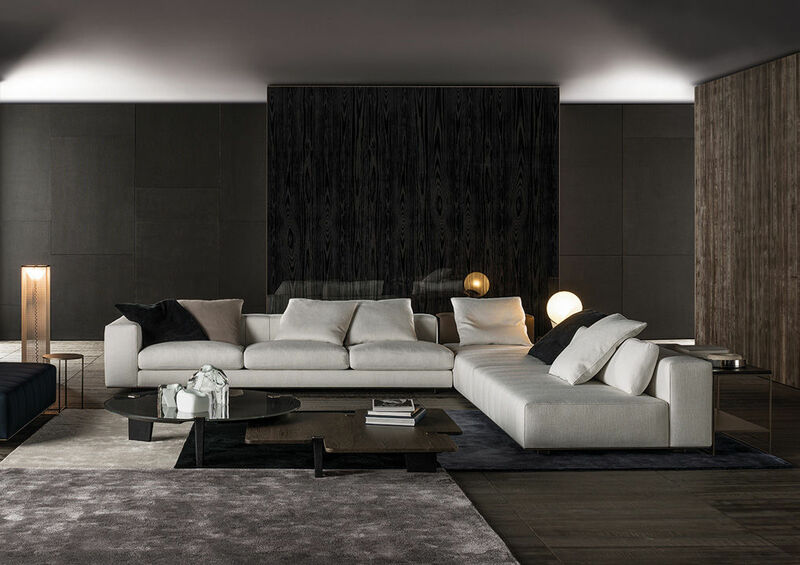 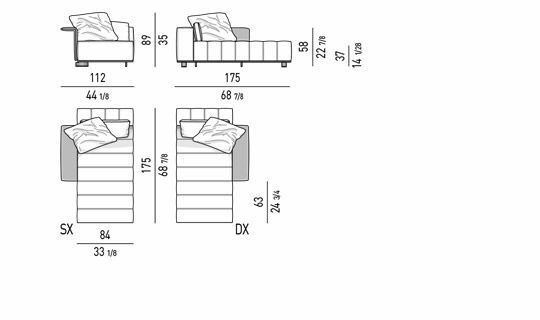 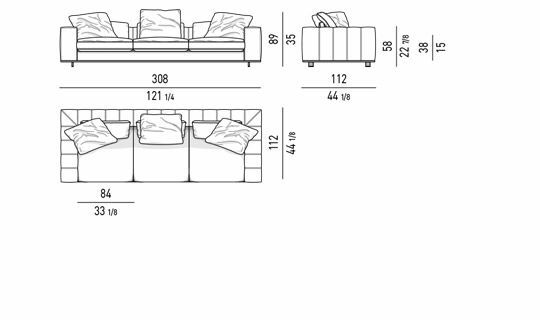 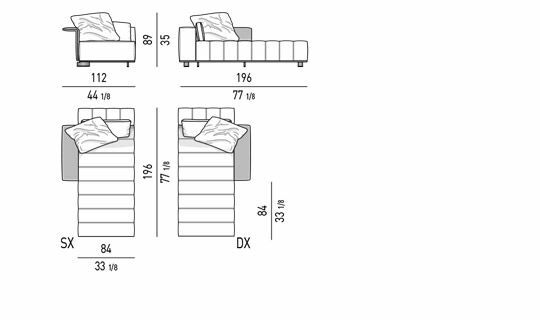 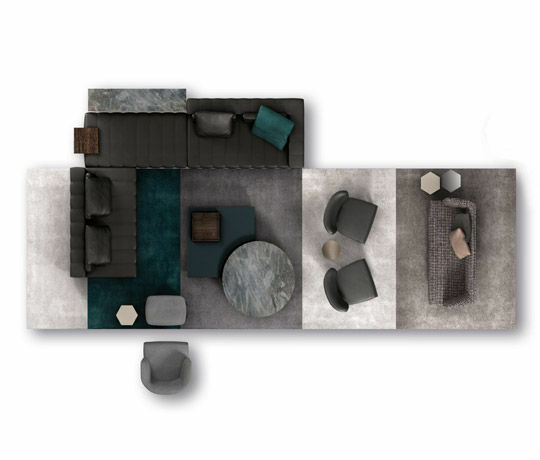 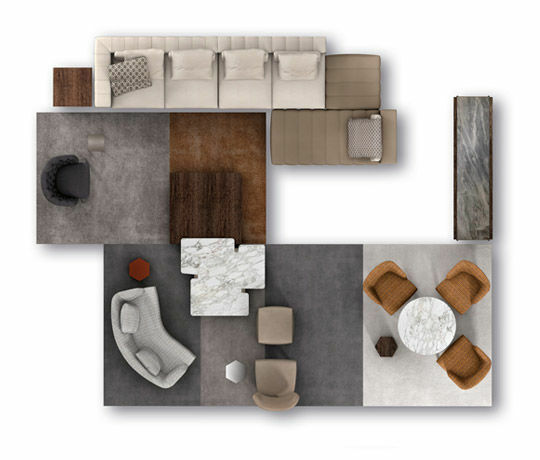 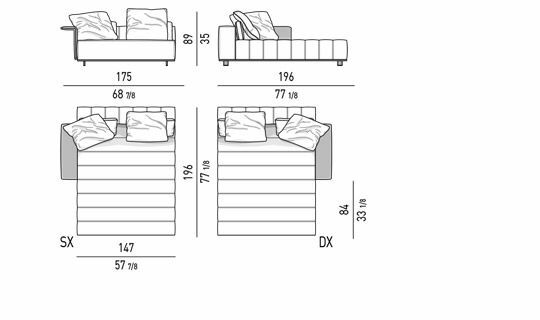 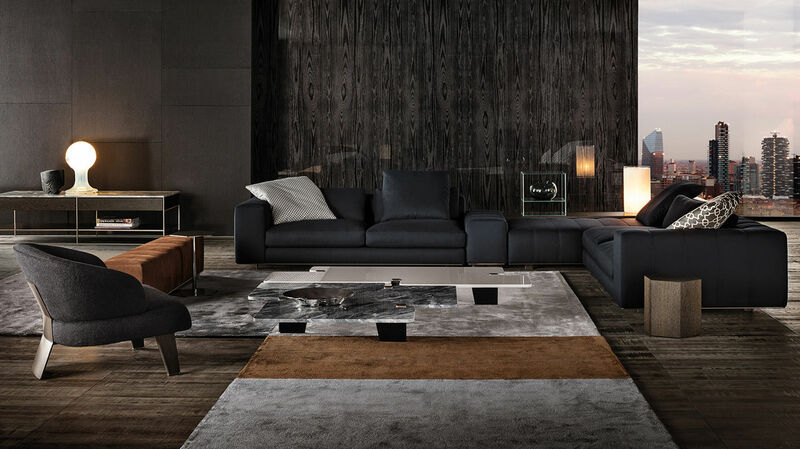 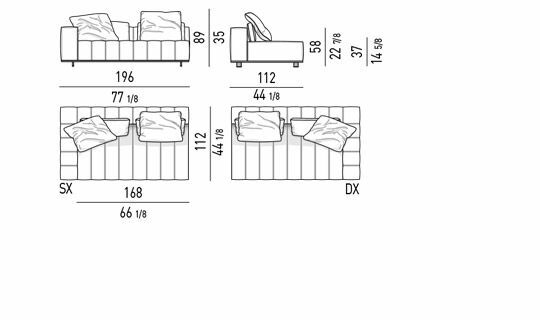 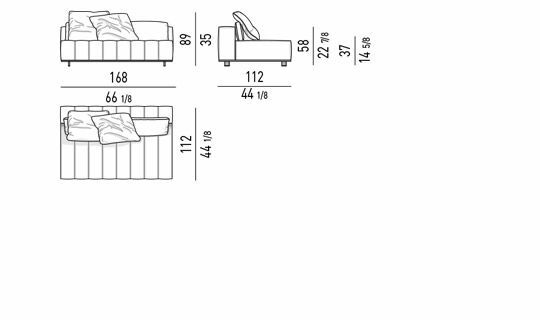 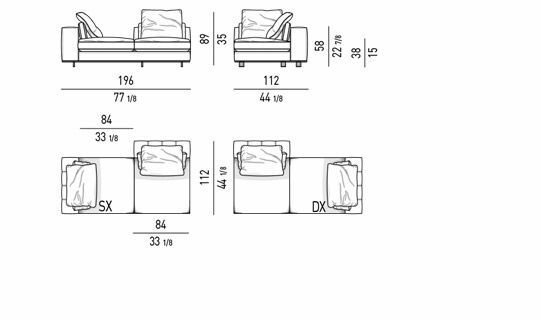 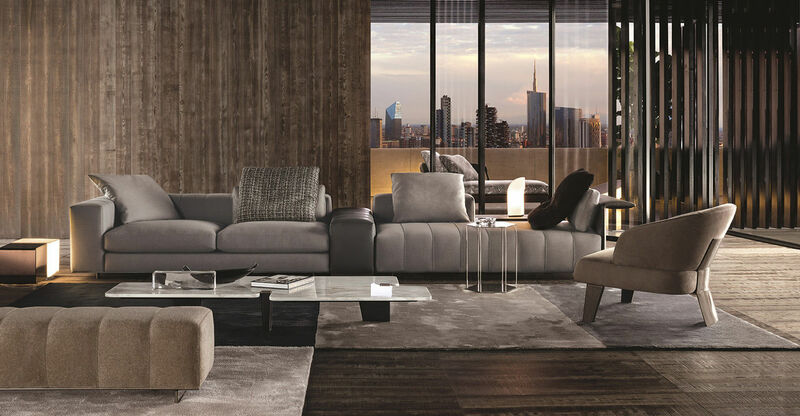 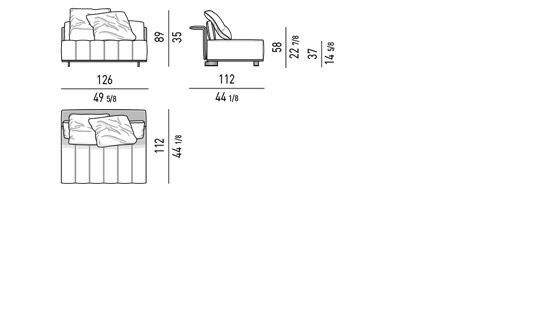 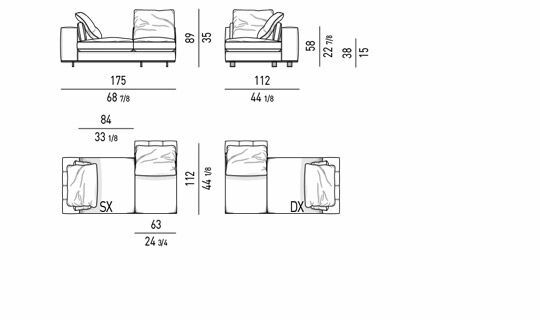 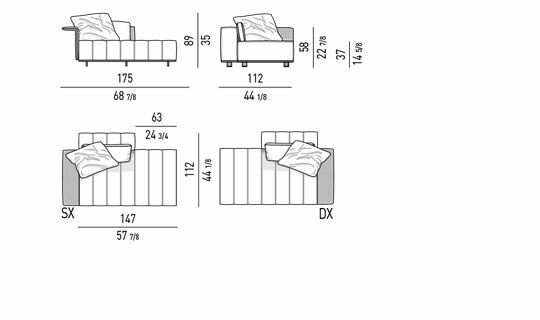 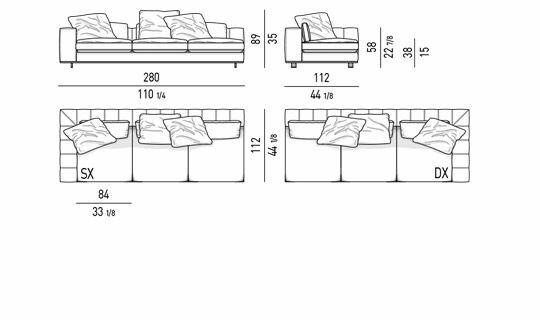 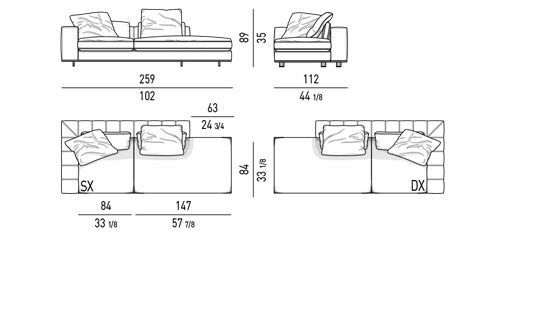 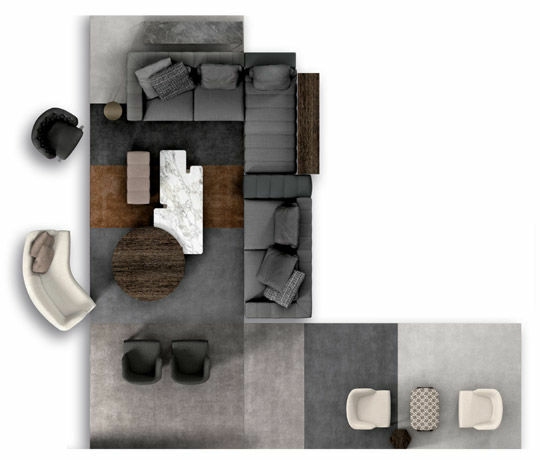 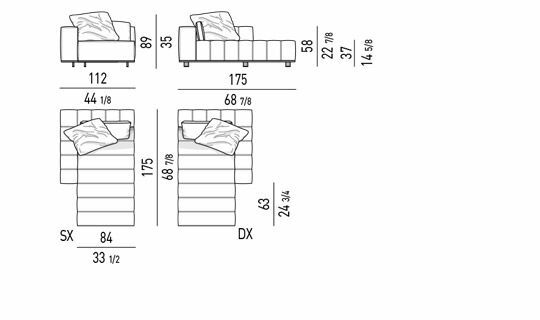 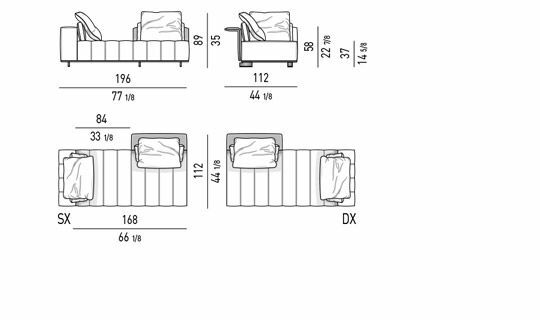 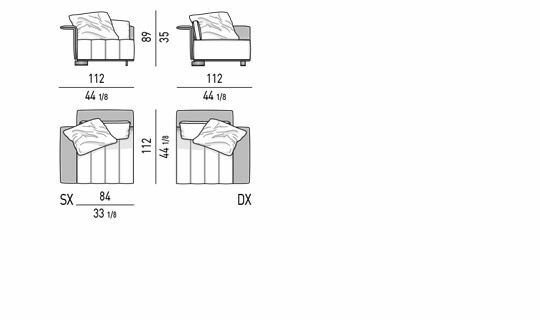 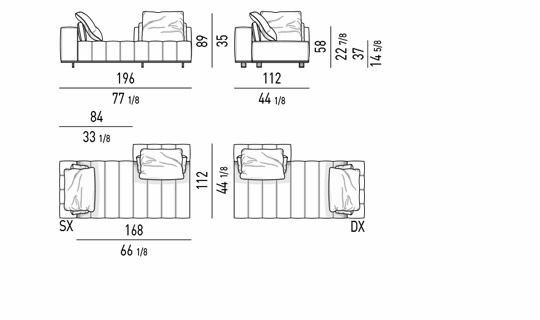 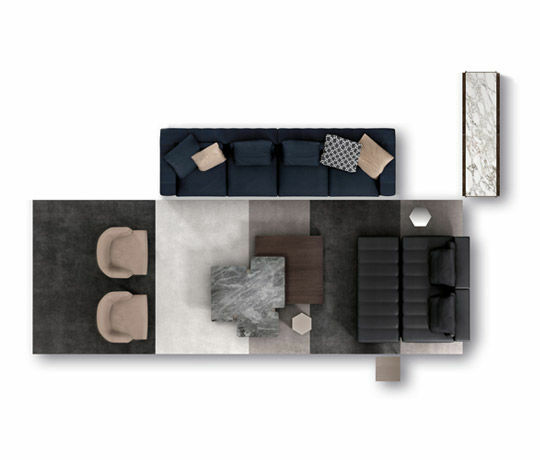 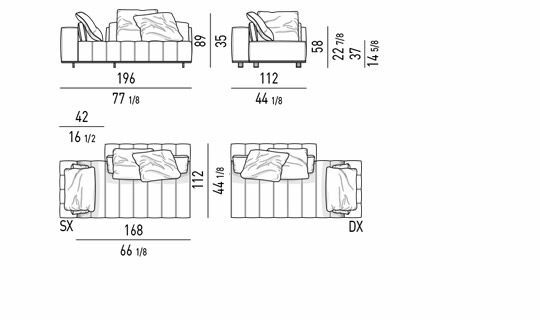 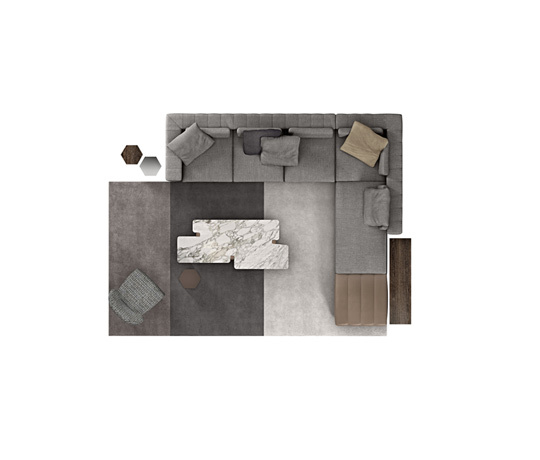 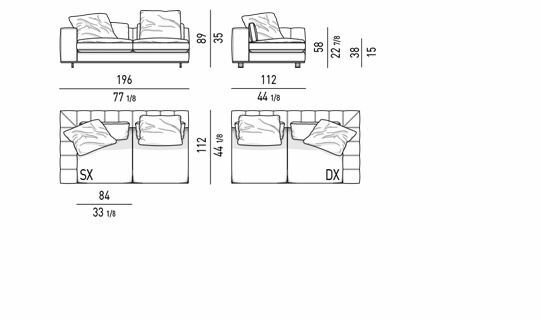 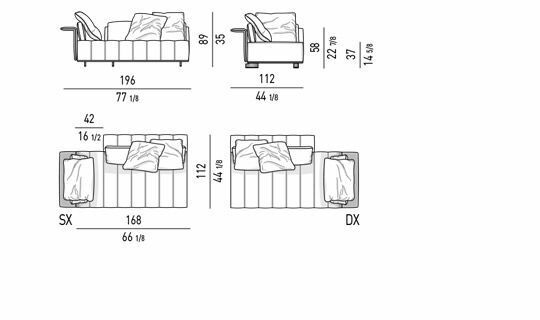 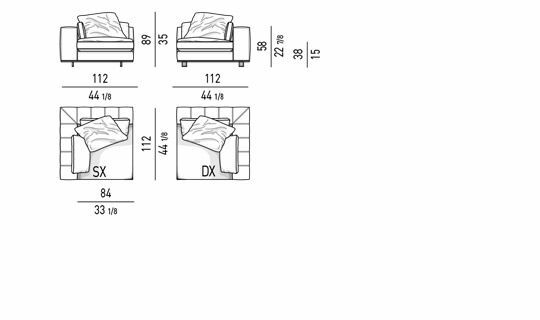 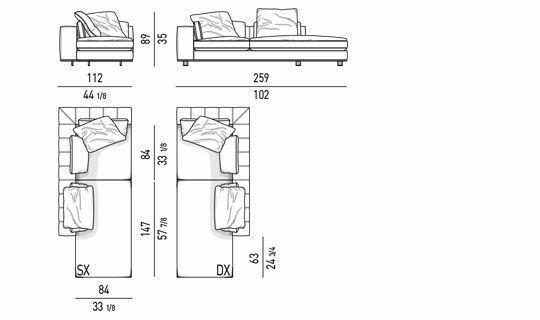 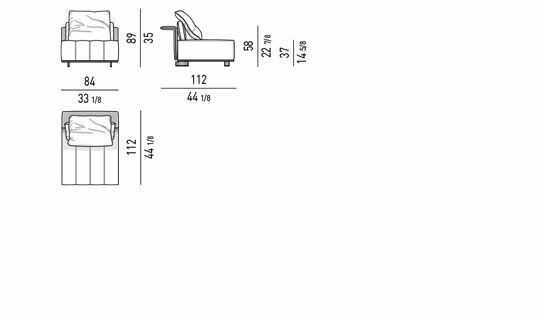 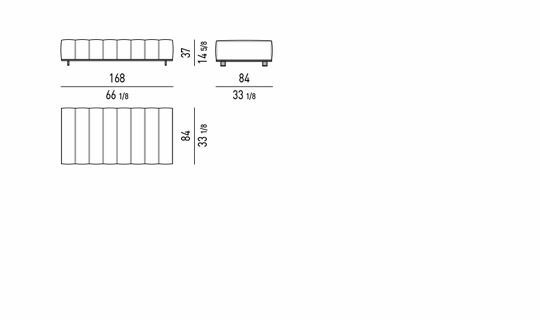 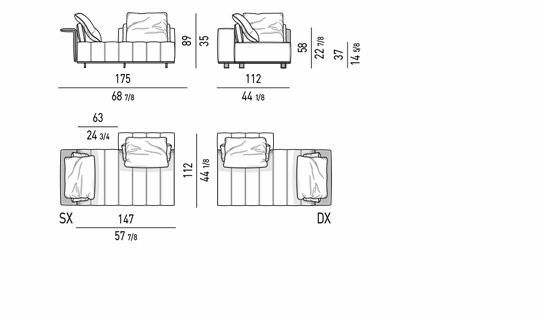 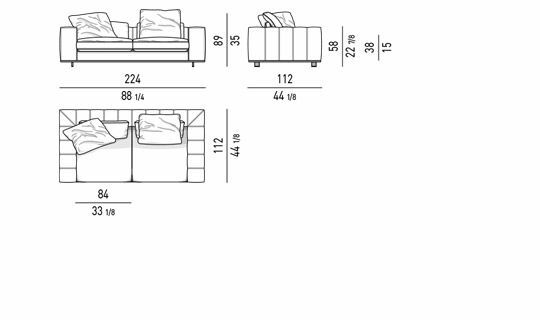 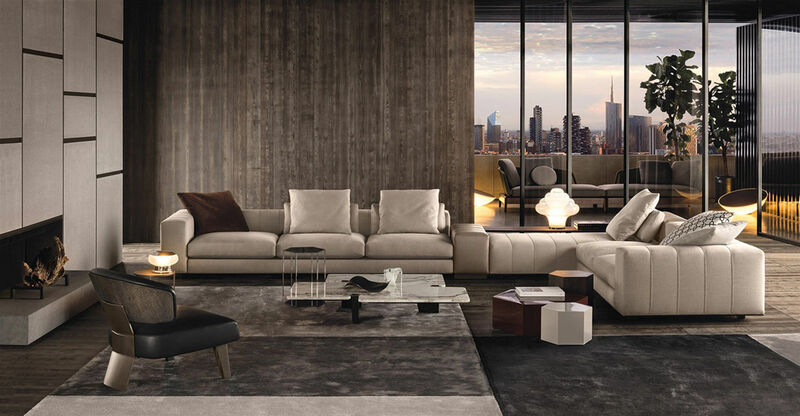 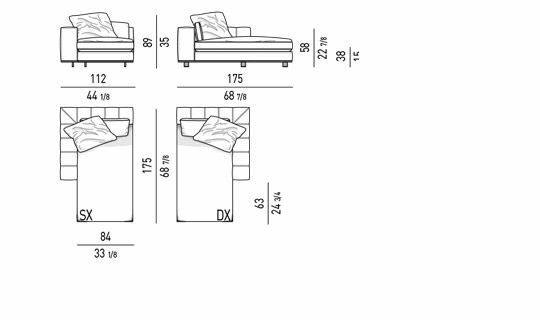 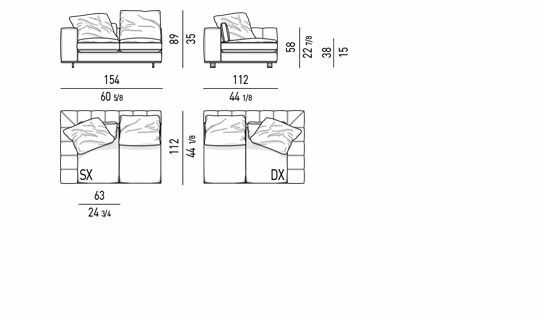 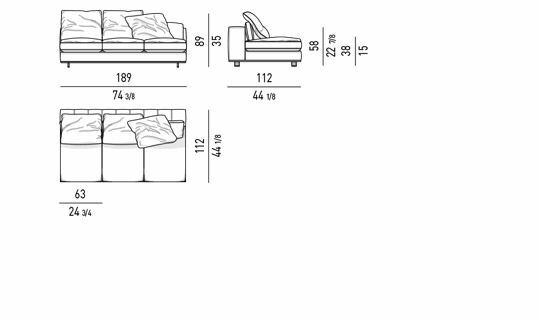 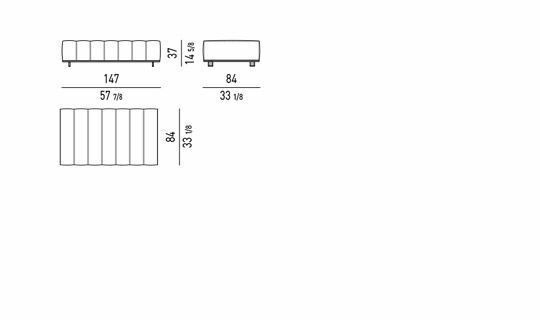 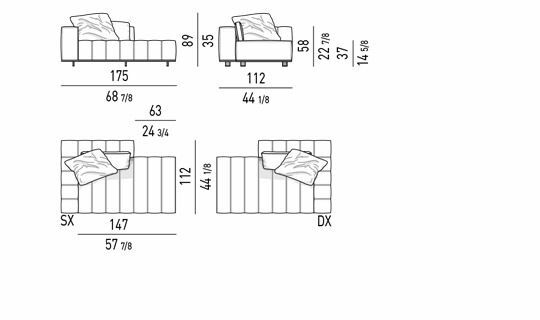 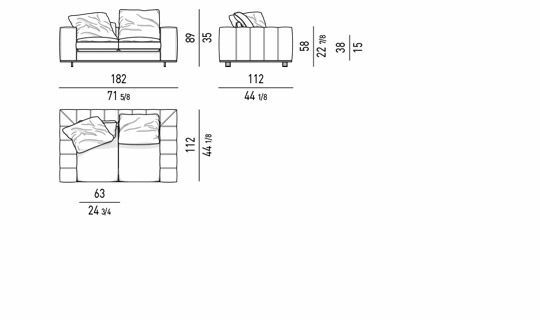 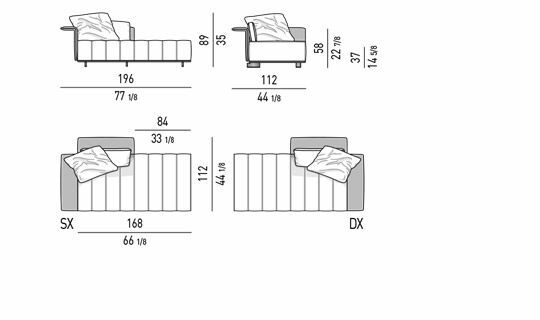 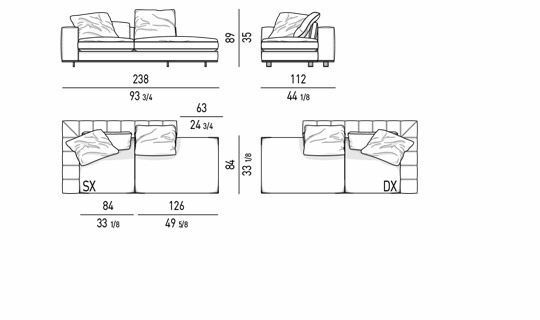 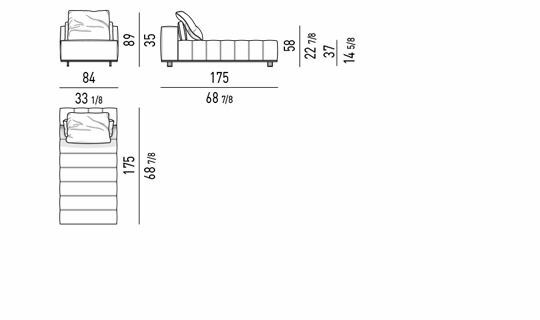 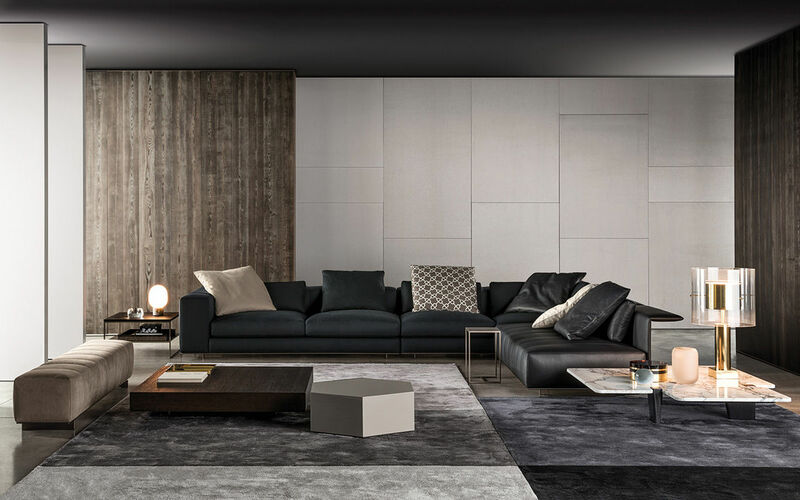 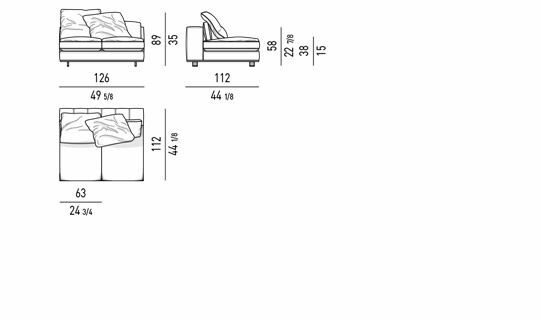 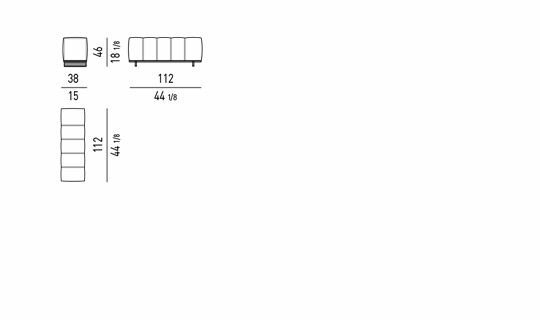 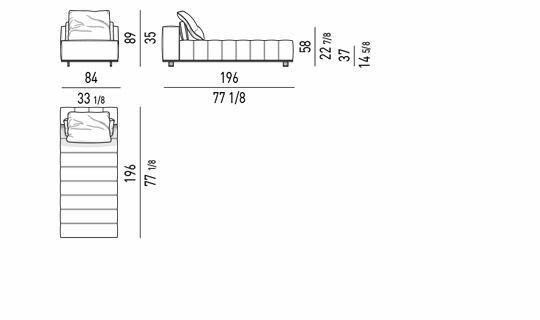 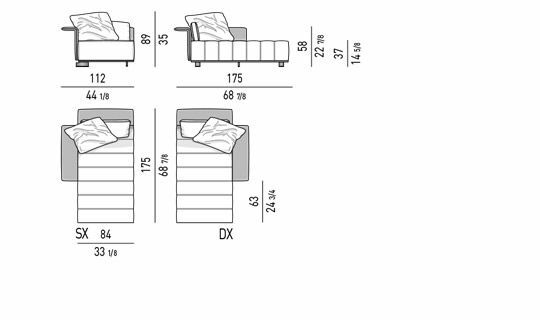 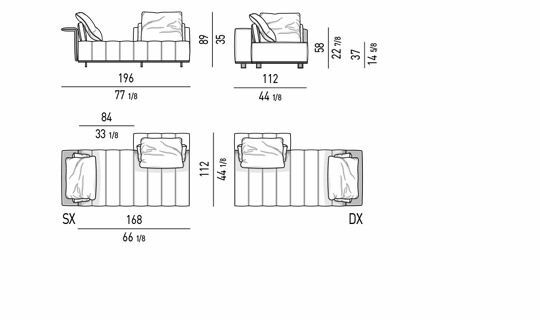 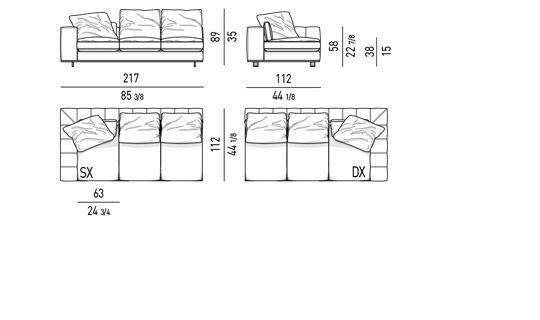 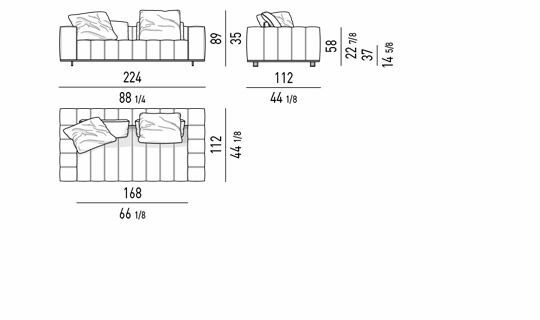 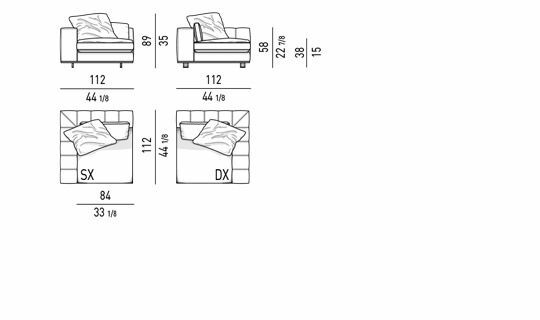 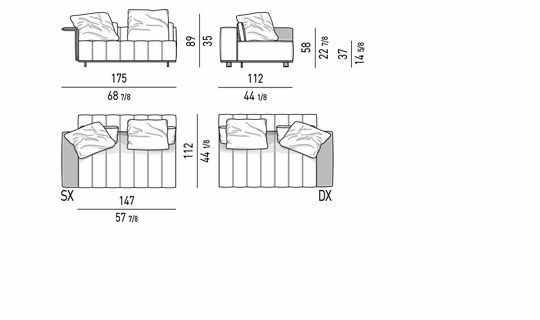 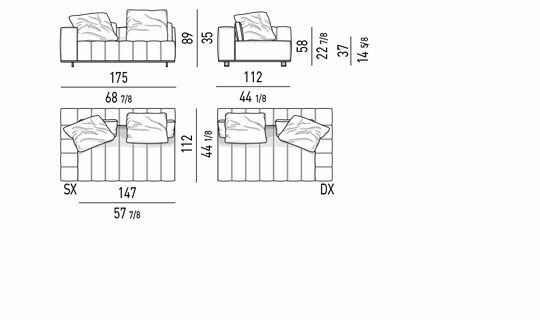 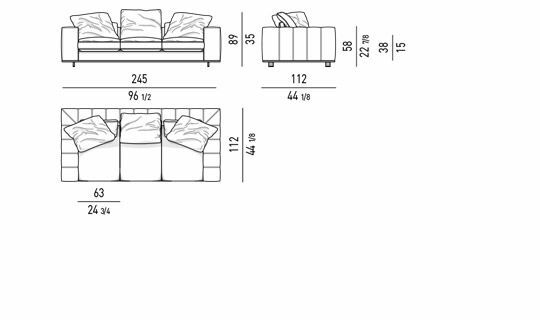 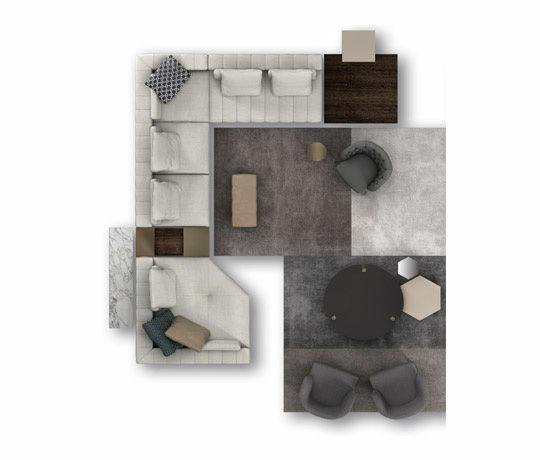 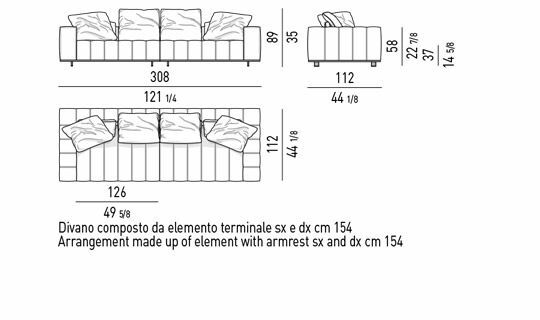 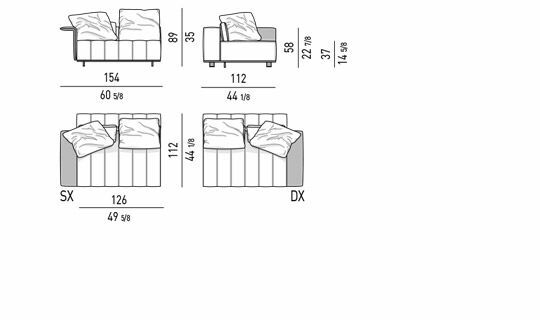 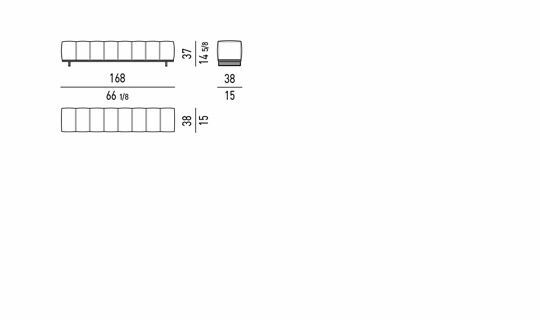 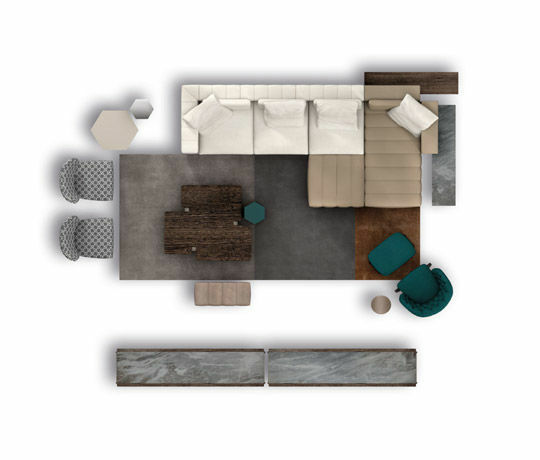 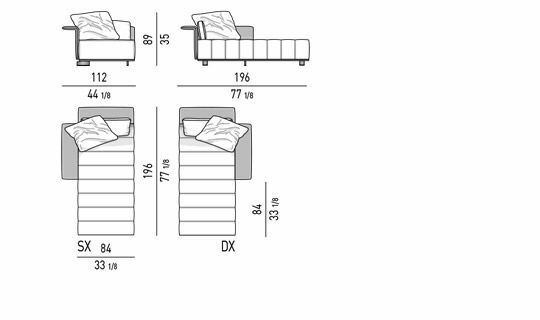 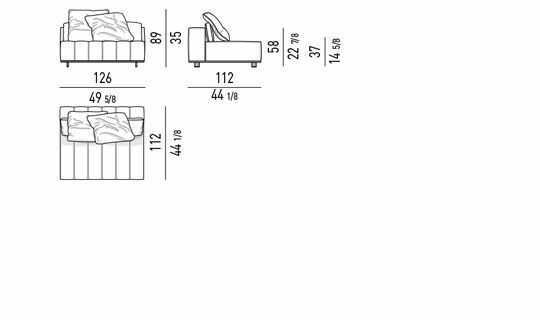 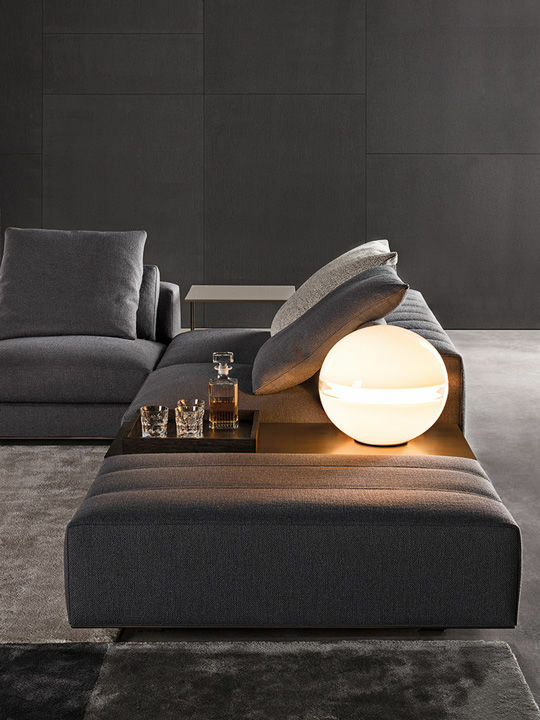 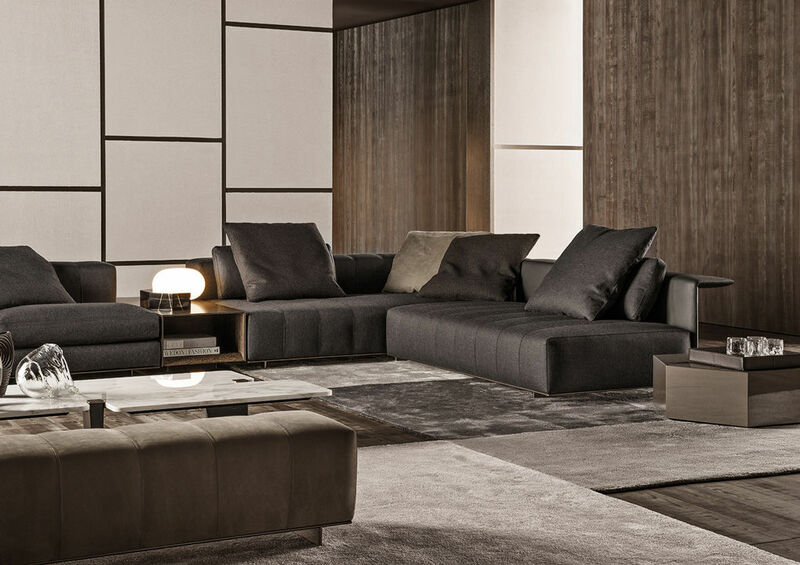 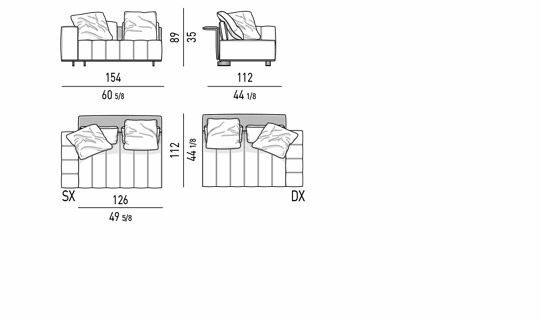 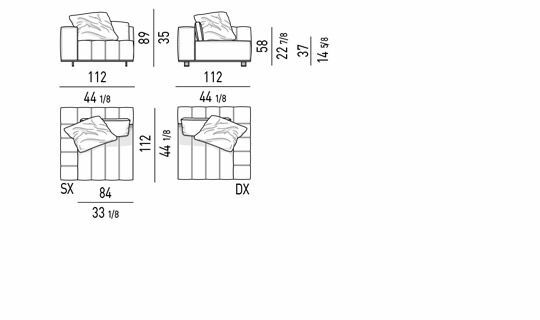 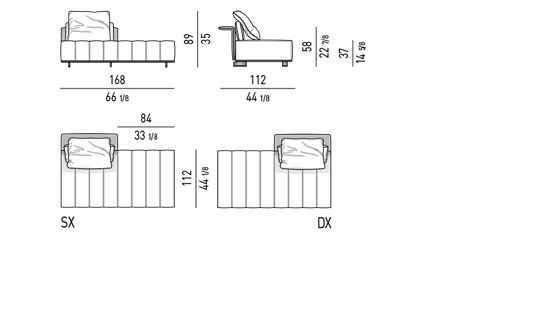 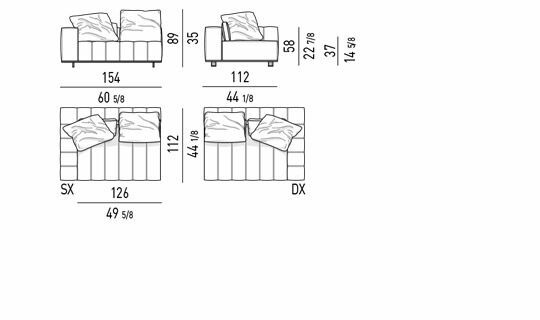 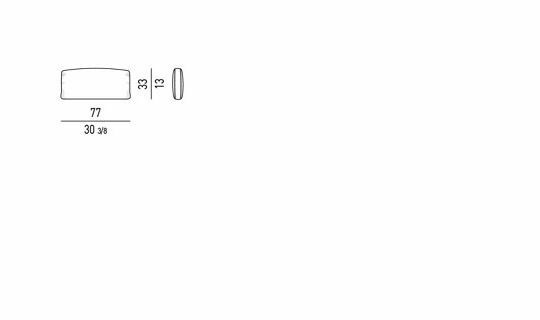 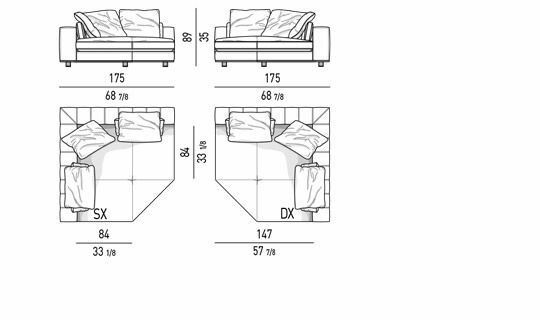 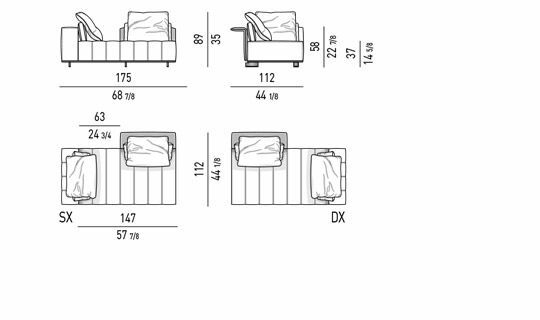 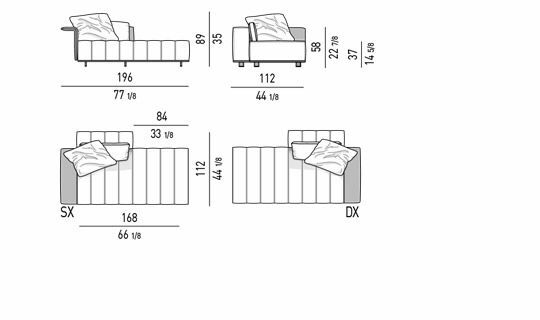 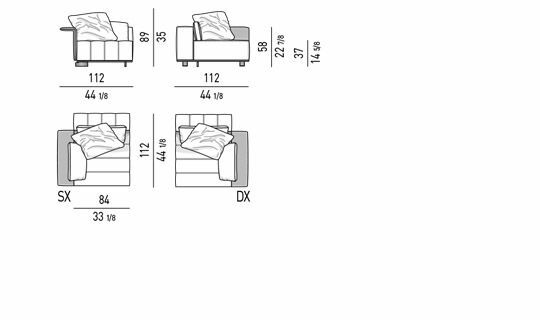 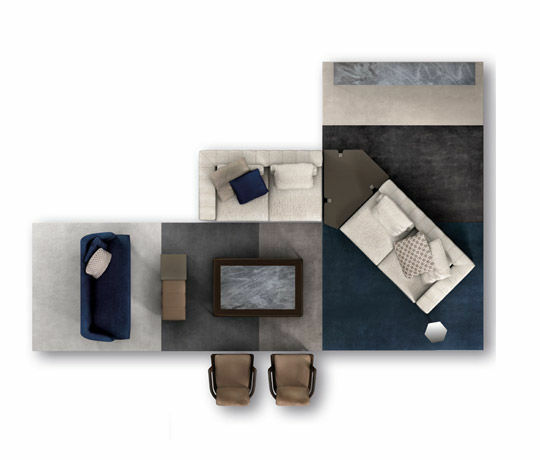 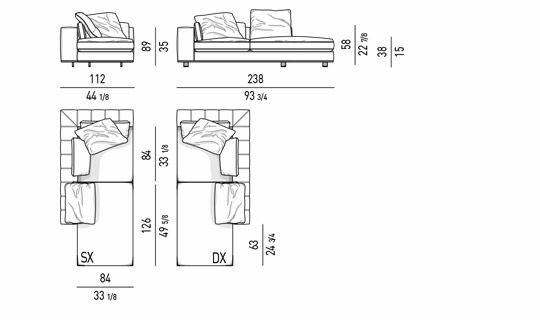 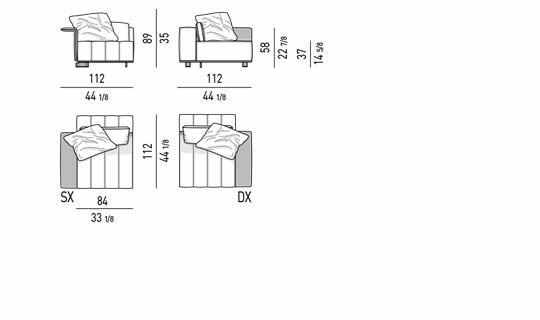 Contact Minotti to see a plan layout for your room. 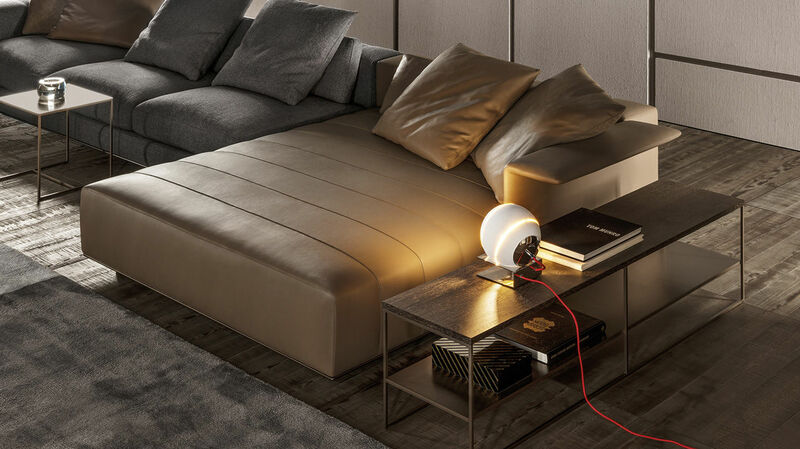 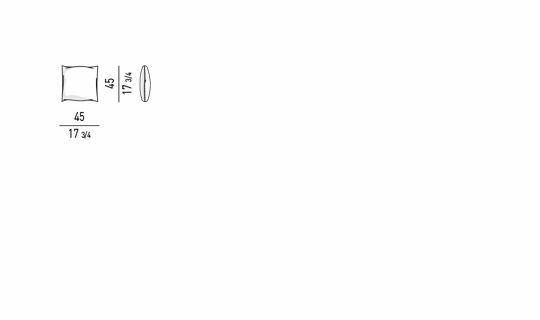 In plywood with suspension provided by high-rubber-content elastic webbing. 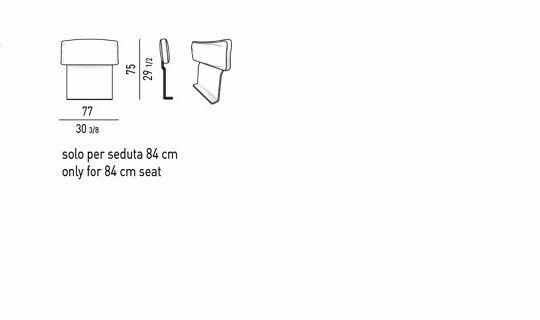 The seat structure is made of high resilience, variable-density polyurethane foam, with a concave contour to cradle the seat cushion in order to maintain its stability and durability. 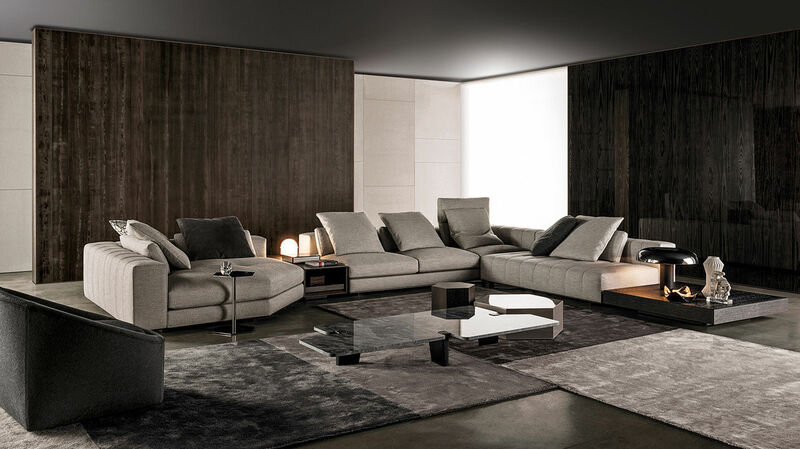 The armrests and backrests have a breathable heat-bonded quilted fiber casing laminated to a white hypoallergenic cotton fabric which lends softness and comfort. 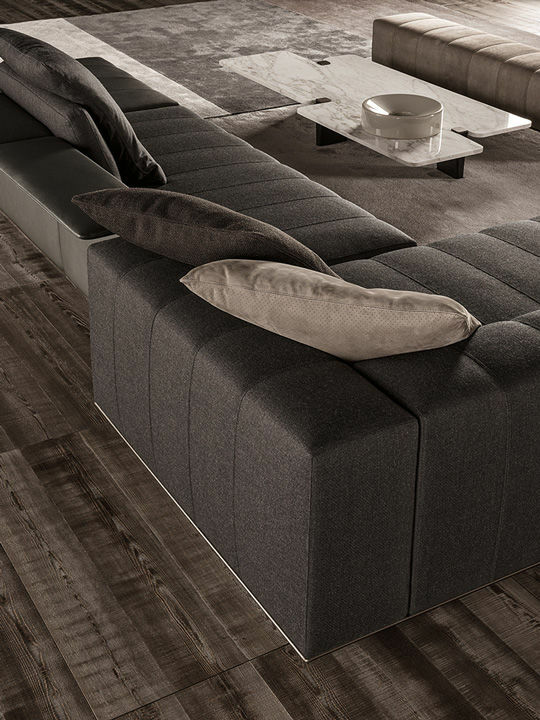 A special assembly was used for the structure covering (backrests and armrests). 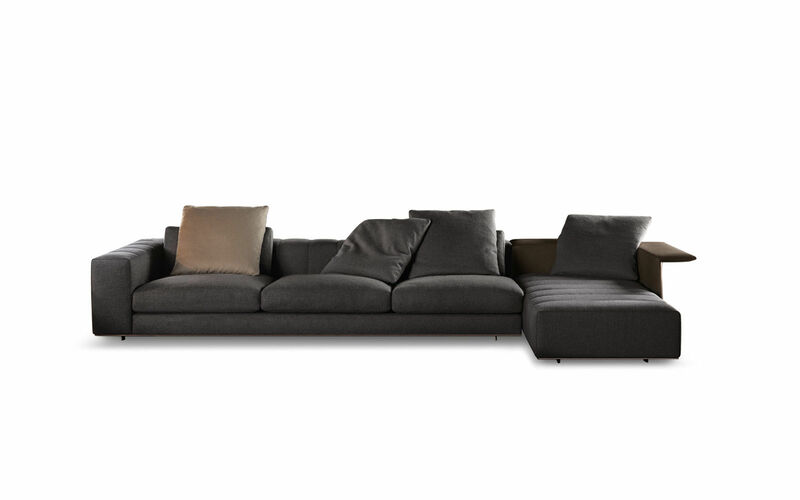 The various parts in fabric were joined by using a bronze-colored strip of eco-leather with doublestitched detail. 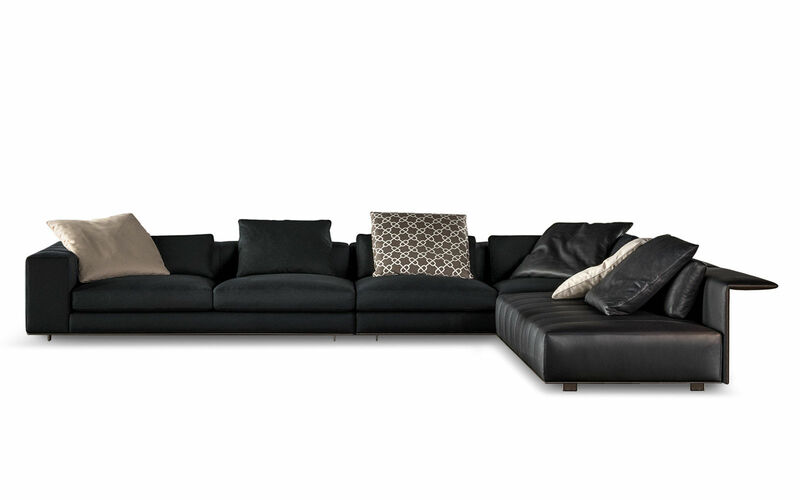 In the leather version, the strip is in the same leather as the one used for the upholstery. 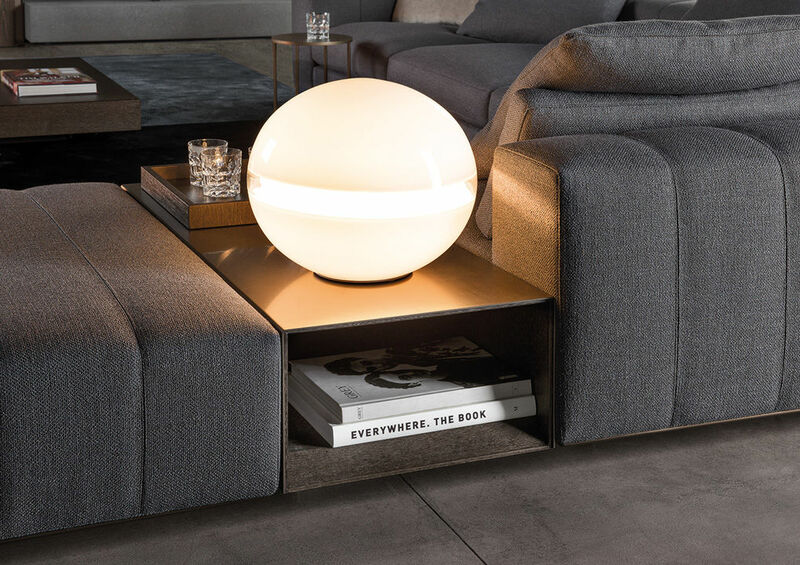 In plywood with suspension provided by high-rubber-content elastic webbing. 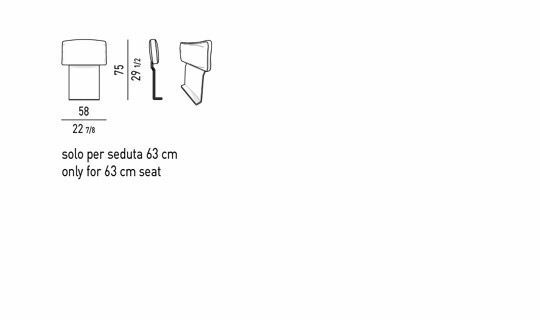 The seat structure is made of several layers of variable-density, high resilience polyurethane foam. 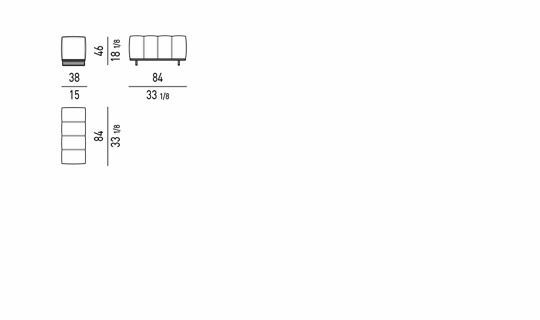 The upper layer is made of single highelastic- content contoured straps which, combined with the lower layer, guarantee enhanced softness over time. 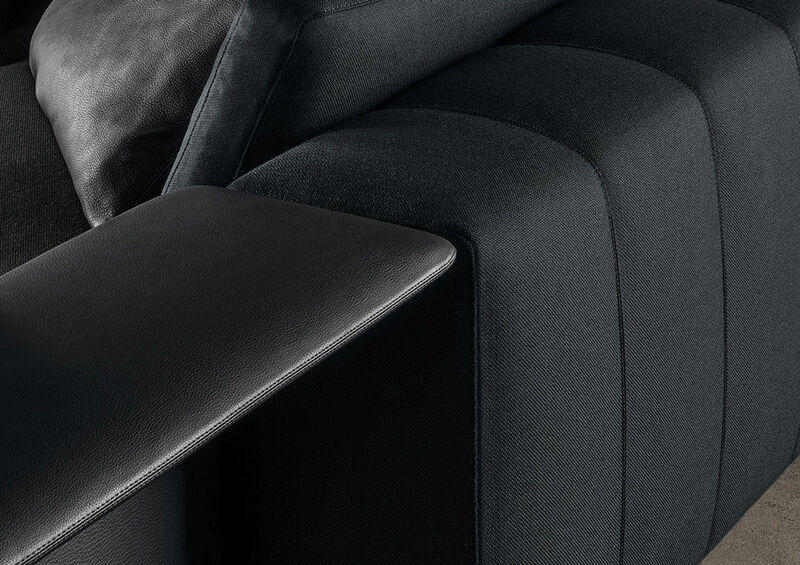 “Wing” and “Mix” have an armrest and/or backrest made of a metal frame coated in fireproof polyurethane foam. 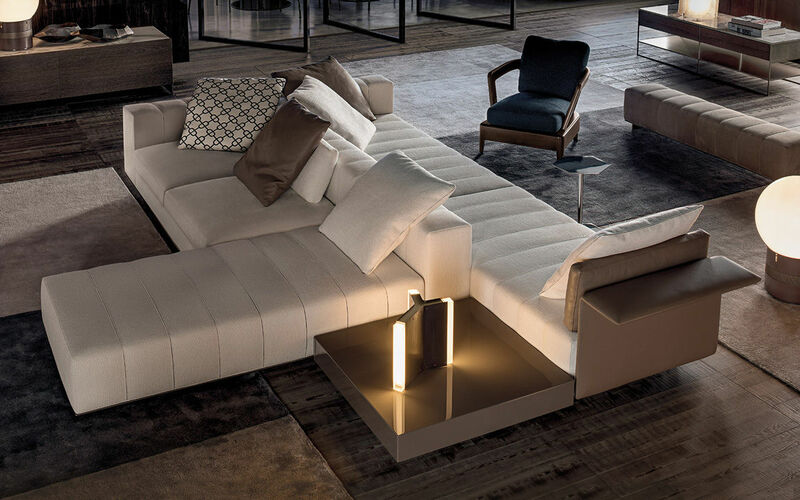 The entire structure has a breathable heat-bonded quilted fiber casing laminated to a white hypoallergenic cotton fabric which lends softness. 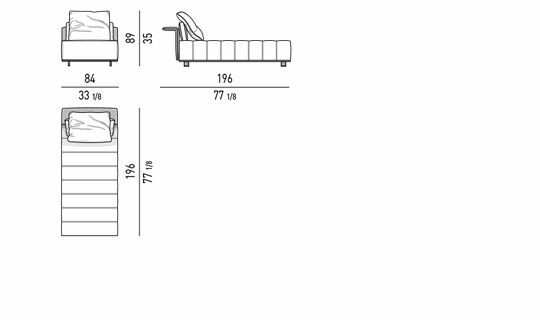 A special assembly was used for the structure covering (backrest and armrests). 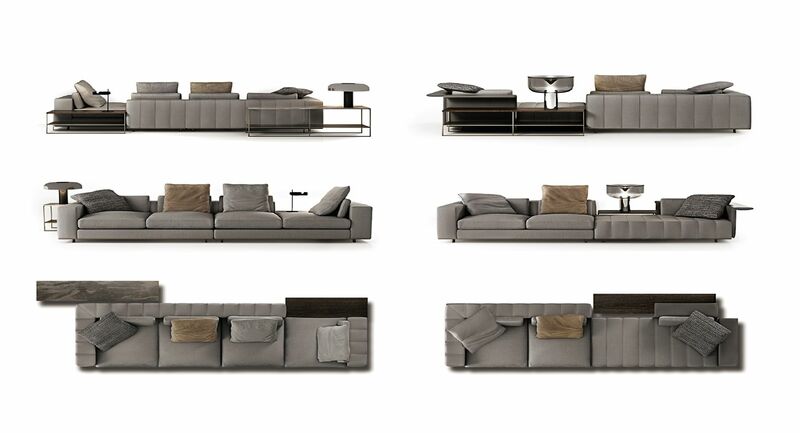 The various parts in fabric were joined by using a bronze-colored strip of eco-leather with double-stitched detail. 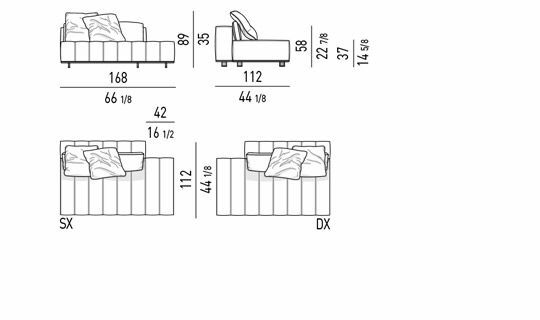 Channeled goose down padding for the backrest cushions (Assopiuma certified, Gold Label) with Memory Foam core insert (temperature-sensitive material). 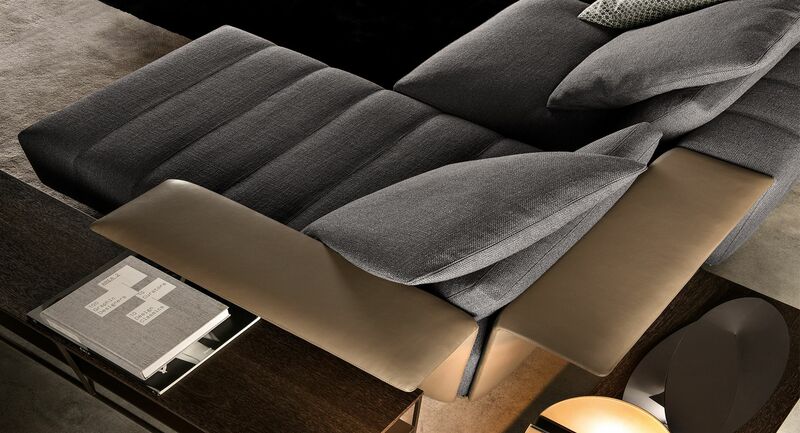 Seat cushions are completely reversible, with channeled goose down padding (Assopiuma certified, Gold Label) and core insert made of high resilience, variable-density polyurethane foam wrapped in a layer of Memory Foam. Channeled goose down padding for the backrest cushions (Assopiuma certified, gold label) with Memory Foam core insert (temperaturesensitive material). 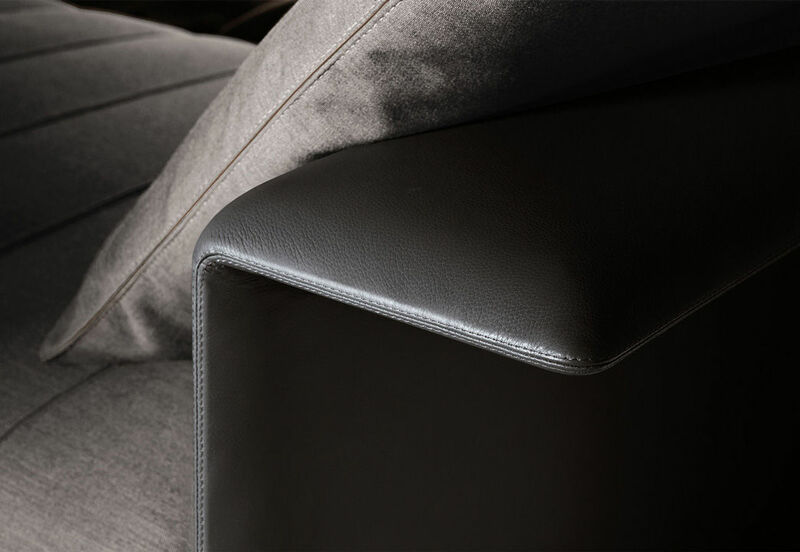 Seat and backrest cushion covers are completely removable in all versions (fabric and leather). 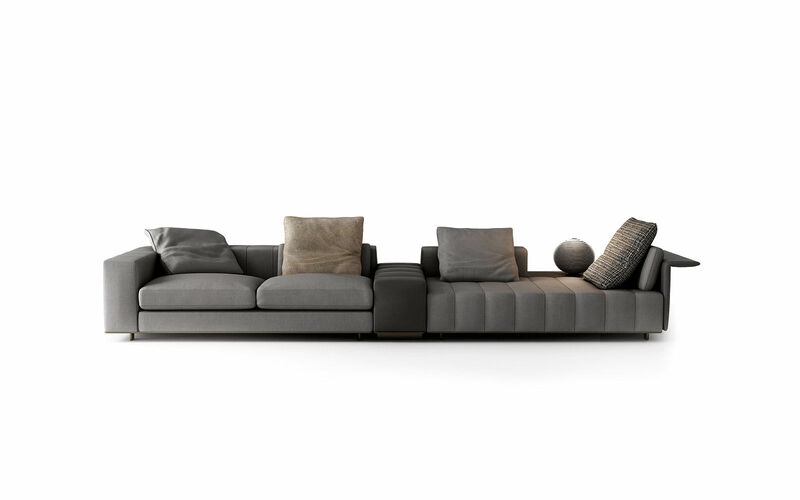 The fabric structure covers come off by removing the metal base after loosening the ribbed handles with the key that is provided. 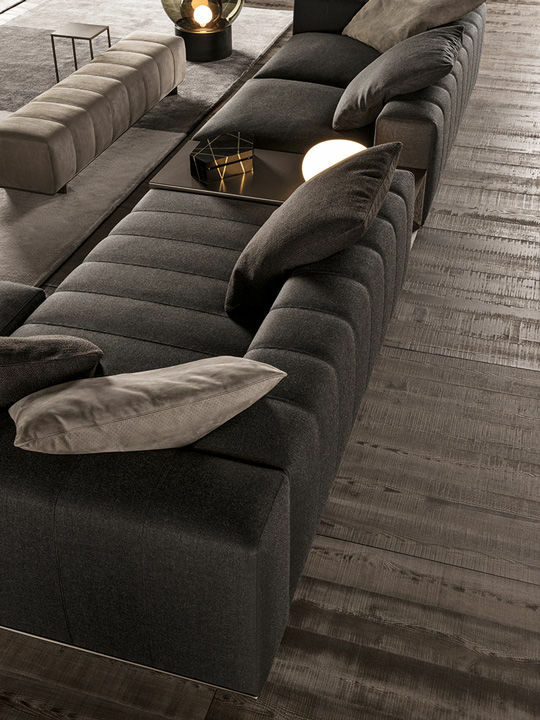 Structural leather upholstery is not removable. 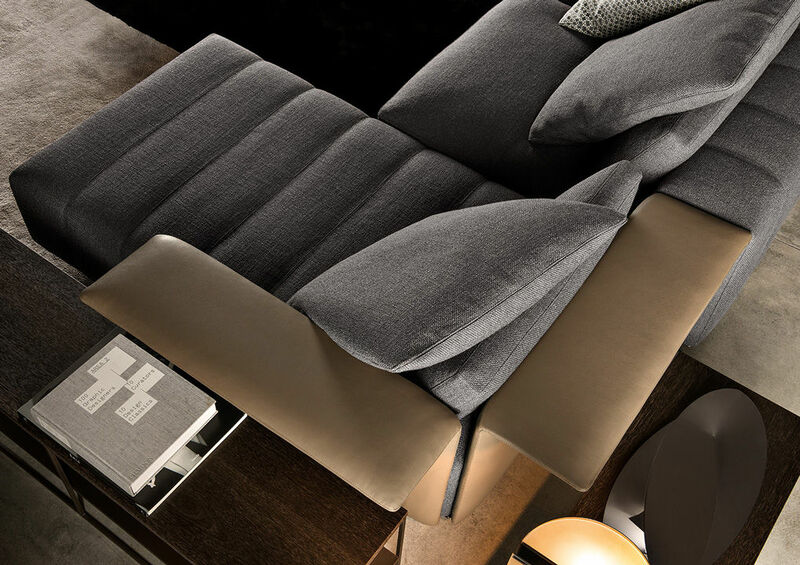 Backrest cushion covers are completely removable in all the versions (fabric and leather). 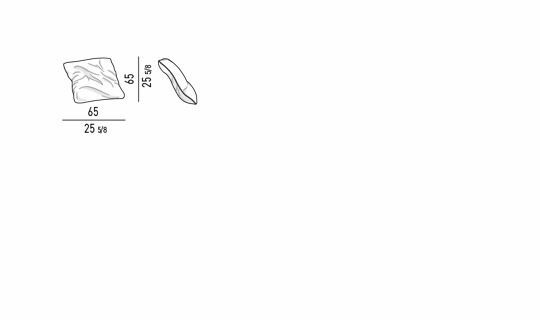 The “Wing” element cover is removable only for the fabric version. 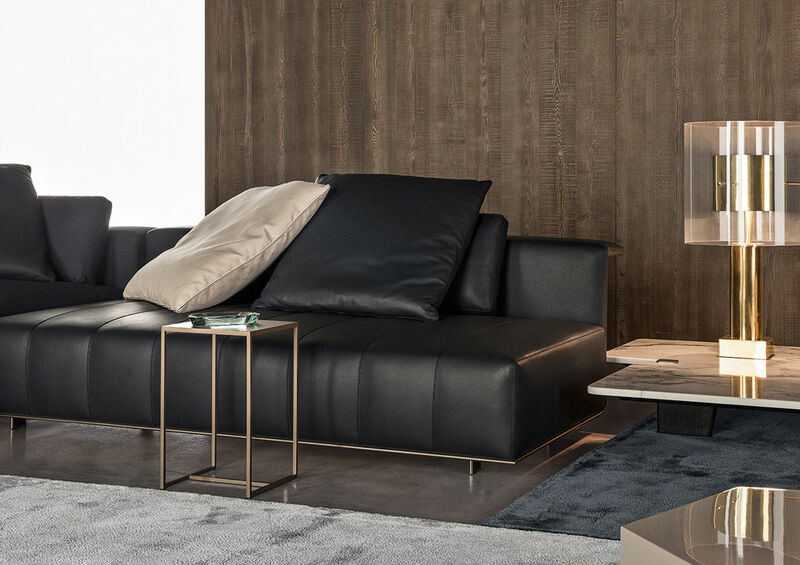 The fabric or leather removable covers of the structure come off by removing the metal base after loosening the ribbed handles with the key that is provided. 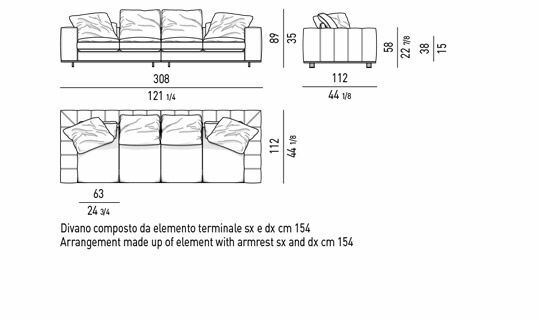 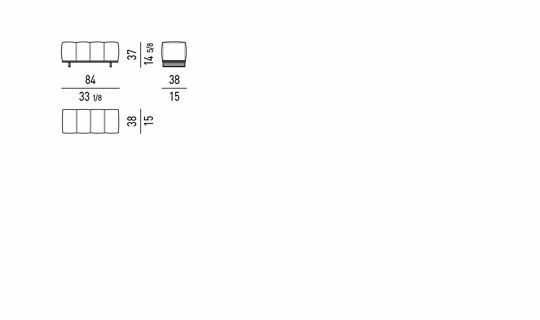 To facilitate transport and removal of covers, the armrests and backrest can be removed from the base by means of a quick coupling and uncoupling system. 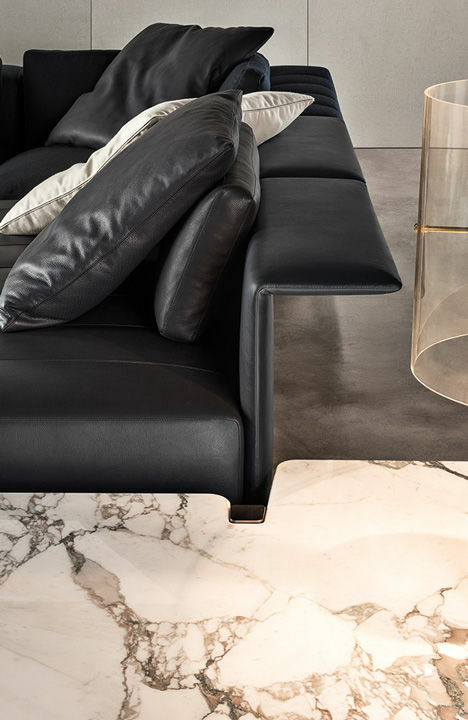 Extruded aluminum frame with cast aluminum joint fittings (both an exclusive design by Minotti Studio), with a glossy anti-fingerprint light Bronze painted finish. 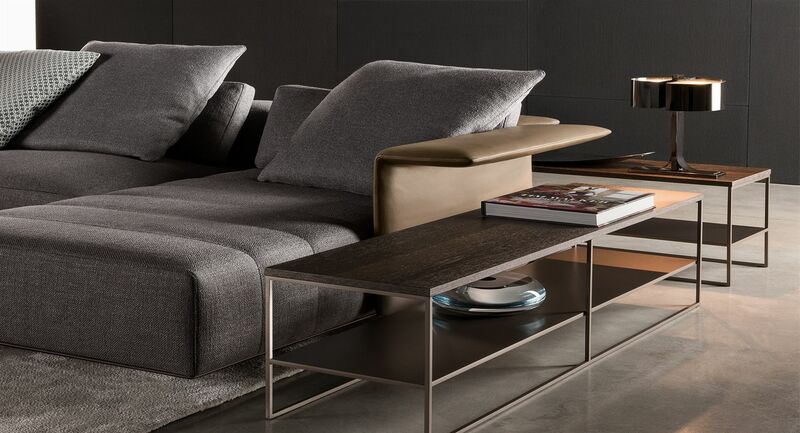 The metal feet also have a glossy light Bronze painted finish. 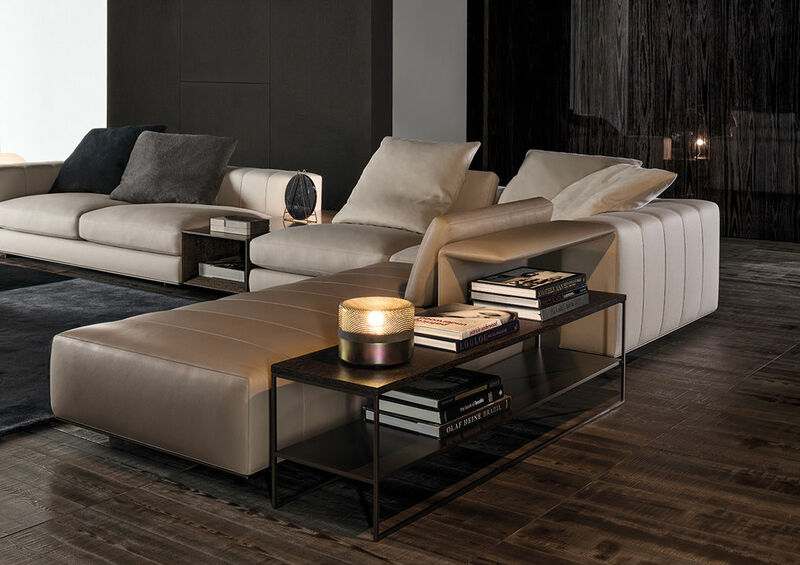 Protective bronze-painted SEBS glide (soft scratchproof rubber).